Trevor Suslow, UC Davis Department of Plant Sciences, serves as the Center's Director. Administrative responsibilities are shared among Center staff. The Center is housed in the Department of Plant Sciences at UC Davis, and receives support from contributions to our Endowment Fund. The Postharvest Technology Center is a self-supporting UC Davis center and depends on income from workshops, publication sales, as well as the endowment to maintain center activities. A two-week short course on postharvest technology of horticultural commodities is presented each year during late June. It includes five days of lectures, discussions and demonstrations, and an optional five-day field trip to major production areas of California. Other annual educational programs are offered on management of fruit ripening, and maintaining quality and safety of fresh-cut products. In addition, workshops of one to three days are held in various locations throughout the state on postharvest handling of fruits, nuts, vegetables, and ornamentals. 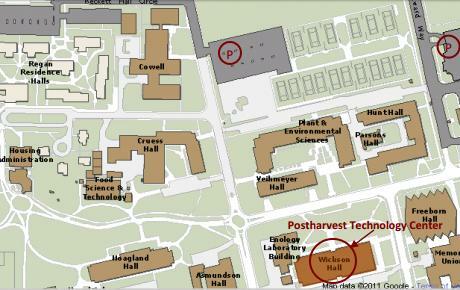 http://postharvest.ucdavis.edu is visited over 1 million times per year, and is comprised of more than 500 web pages and 2,000 documents containing useful postharvest information. Our members present research results and postharvest information at meetings of various industry organizations. In addition, local meetings are held in cooperation with farm and family, nutrition and consumer science Advisors to disseminate information about proper postharvest handling procedures. Individual consultations in person and by telephone constitute an important route for evaluating industry problems and extending information to California's shippers, handlers, and the general public. Available through our bookstore are approximately 50 titles providing the latest information about a wide range of postharvest technology topics. We distribute a free monthly newsletter via e-mail, featuring information about new content on our Web site, upcoming courses, new publications written by UC postharvest specialists, and current events. Close cooperation, in relation to their educational programs, is maintained with various trade organizations such as the California League of Food Processors, International Association of Refrigerated Warehouses, Produce Marketing Association, National Perishable Logistics Association, Refrigerating Engineers and Technicians Association, and United Fresh Produce Association. In addition, close liaison is maintained with the California Advisory Boards and Commissions for various horticultural crops.